The opening of the new citadel in Ashley Road, the Bristol headquarters of the Salvation Army, was the occasion on Saturday of considerable rejoicing among the members of the different corps in the city. The old barracks in York Street were destroyed by fire 18 months ago, and the Army has raised in their place a building which is even, from an architectural point of view, a credit to the neighbourhood. There are two halls, the larger capable of seating 2000 people, and a smaller hall for 500 children. The Circus idea has been partially adhered to in the large ball because of the facility this arrangement gives for everyone to view the platform. There is a gallery running round all the sides of the buildings merging into the speaker's platform at one end, thus giving easy access from any part of the gallery to the ground floor without using the staircases. The large hall measures 84 feet by 69 feet, and is 34 feet high. it is approached from Ashley Road by a main entrance corridor, 10 feet wide, lighted with a glass roof. The building is well supplied with exits, there being three spacious staircases from the gallery and five exit doors to Ashley road. All the doors are made to open outwards, and it is confidently believed that the building could be emptied in three minutes. The hall is lighted on both sides and also by a large ceiling light. The usual dark corners under the gallery, in buildings of this character, are not seen here, owing to the arrangement adopted to utilise the light obtainable from the roof of the entrance corridor. The walls have not yet been decorated, as it is proposed to leave this work until the spring. The front of the gallery has been formed with a frieze, decorated with Scripture quotations, and on the top of this are an iron rail and standards of finished bronze. A noticeable feature in the building is that there are no columns above the ground floor. The difficulties of the wide span have been overcome by using steel girders. Grouped round the platform there are various band rooms and vestries. The inaugural service was conducted in the building on Saturday night by Commissioner Coombs, the officer in charge of the provincial operations of the Army. There was a crowded gathering, and much enthusiasm prevailed. 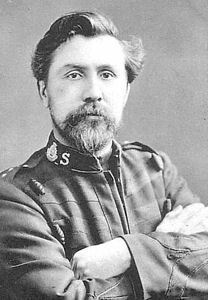 The Commissioner was supported by Brigadier Hodder, in charge of the western provinces, and Col. Whatmore, head of the London junior work. Five bands occupied the platform and accompanied the singing of hymns. The service throughout was marked by special heartiness. This report of the opening of the new Bristol Citadel was published in the Bristol Mercury, 26th December 1896.